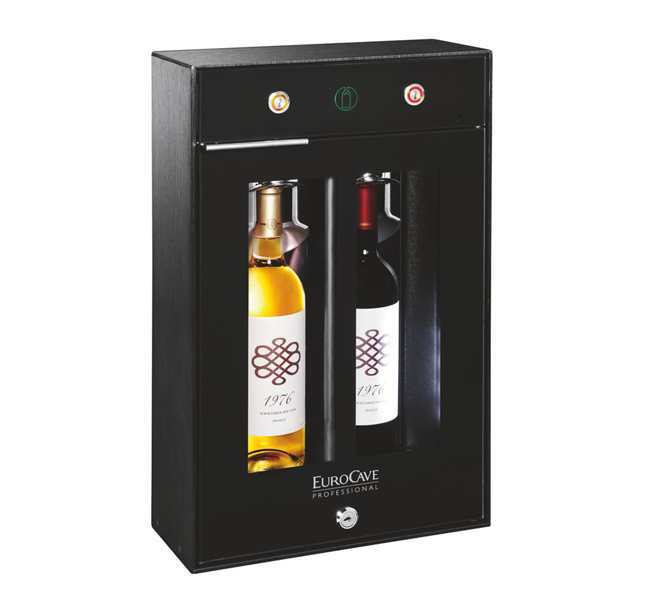 The Eurocave WineBar is unique as it allows you to serve wine by the glass at the table rather than a wine dispensing machine. Launching in September 2016, the WineBar 2.0 is perfect for restaurants or wine merchants wanting to offer a small selection of wine by the glass. Wine can be served at ideal drinking temperature and preserved for up to 10 days so no waste! The Eurocave WineBar is unique as it allows you to serve wine by the glass at the table rather than a wine dispensing machine. The WineBar 2.0 is perfect for restaurants or wine merchants wanting to offer a small selection of wine by the glass. Wine can be served at ideal drinking temperature and preserved for up to 10 days so no waste! WineBar 2.0 preserves open bottles for up to 10 days meaning you can offer wine by the glass with little or no wastage and protect your profits. The independent temperature compartments means you can have both a red and white wine ready to serve at the ideal drinking temperature. Bottle handling is simple and quick and allows the bottle to be taken to the table for pouring, enhancing the customer experience by respecting the traditional of serving wine at the table. Multiple units can be connected so if you ever expand your range of wines by the glass you can add to your WineBar with seamless presentation. EuroCave has been designing and manufacturing sophisticated products in France for more than 40 years. All are made with the highest quality components making them able to with stand the high demands of the professional world.